Seems like the kids over at STI can never leave well enough alone. Every time we turn around they are delivering and new and improved tire or wheel that has us salivating to give it a try. Case in point is their new Sand Wedge Tire that was just dropped upon us this week. Check it out at STI Tire and Wheel. 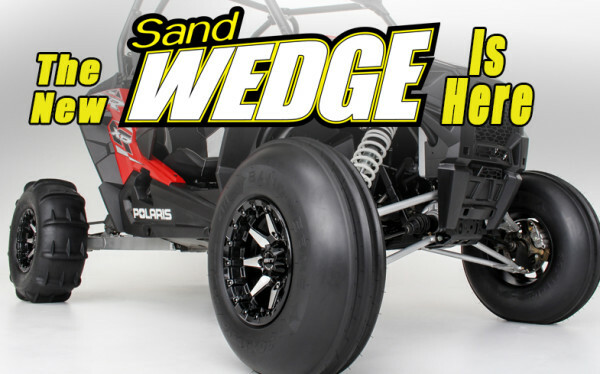 STI Tire & Wheel introduces the all-new Sand Wedge tires , delivering a new high-performance standard for UTV handling and control in the sand dunes. The tires are designed and developed to allow today’s large UTVs to float over rough dune sections, and to make the most of their power. The massive Sand Wedge tires measure 30 inches tall and are the largest sand tires made for popular 14-inch wheels. With a wide profile and flexible 4-ply carcass, they provide maximum flotation and ride comfort. Each of the 12 “scoop” paddles on the rear measures 1 inch tall; their reinforcing ribs handle the power of big-bore UTVs. The front Sand Wedge tires use a centered tri-rib design to give unmatched handling and steering control. The front tire (30/11-14) retails for $172.85, and the rear tire (30/14-14) retails for $205.40. They’re available now.